Like many drugs, caffeine is chemically addictive, a fact that scientists established back in 1994. Soon after you drink (or eat) something containing caffeine, it’s absorbed through the small intestine and dissolved into the bloodstream. Because the chemical is both water- and fat-soluble (meaning that it can dissolve in water-based solutions—think blood—as well as fat-based substances, such as our cell membranes), it’s able to penetrate the blood-brain barrier and enter the brain. Structurally, caffeine closely resembles a molecule that’s naturally present in our brain, called adenosine (which is a byproduct of many cellular processes, including cellular respiration)—so much so, in fact, that caffeine can fit neatly into our brain cells’ receptors for adenosine, effectively blocking them off. Normally, the adenosine produced over time locks into these receptors and produces a feeling of tiredness. 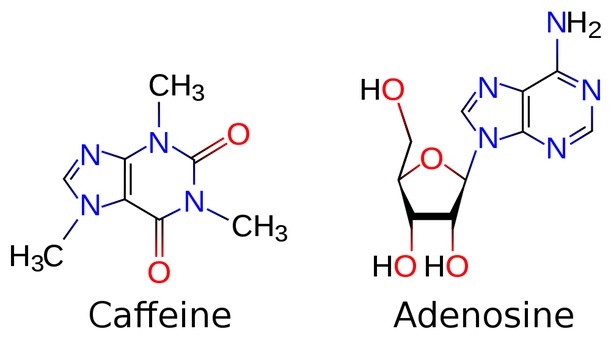 Caffeine structurally resembles adenosine enough for it to fit into the brain’s adenosine receptors. For this reason, caffeine isn’t technically a stimulant on its own, says Stephen R. Braun, the author or Buzzed: the Science and Lore of Caffeine and Alcohol, but a stimulant enabler: a substance that lets our natural stimulants run wild. Ingesting caffeine, he writes, is akin to “putting a block of wood under one of the brain’s primary brake pedals.” This block stays in place for anywhere from four to six hours, depending on the person’s age, size and other factors, until the caffeine is eventually metabolized by the body. In people who take advantage of this process on a daily basis (i.e. coffee/tea, soda or energy drink addicts), the brain’s chemistry and physical characteristics actually change over time as a result. The most notable change is that brain cells grow more adenosine receptors, which is the brain’s attempt to maintain equilibrium in the face of a constant onslaught of caffeine, with its adenosine receptors so regularly plugged (studies indicate that the brain also responds by decreasing the number of receptors for norepinephrine, a stimulant). This explains why regular coffee drinkers build up a tolerance over time—because you have more adenosine receptors, it takes more caffeine to block a significant proportion of them and achieve the desired effect.